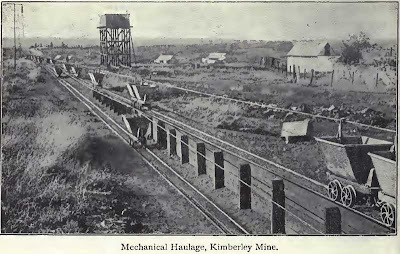 De Beers has been mining in Kimberley for more than 120 years. 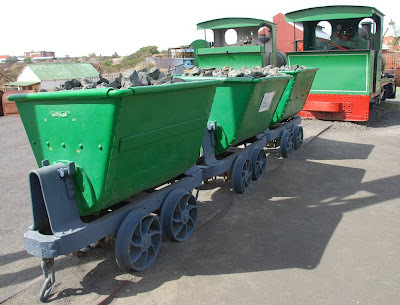 The recent closure of underground operations at Kimberley Mines marked the end of underground mining in Kimberley, as we know it. De Beers’ presence in Kimberley continues, however, in the processing of the tailings resources through the multi million rand Combined Treatment Plant, as well as the Big Hole Project, a unique and exciting way for De Beers to invest in tourism activities, ultimately supporting the communities that surround Kimberley Mines. 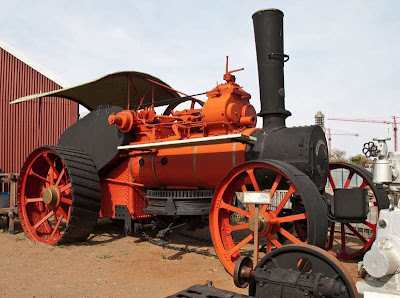 The old Diamand Museum in Kimberley has a new name - the BIG HOLE - it has been totally redeveloped and is well worth a visit. Read more about it here. 1 September 2009 -- "Olive" (left) [Bagnall No 1814/1907], and her mate [Bagnall No 1817/1907] can be seen at the Kimberley diamond mine museum - both 0-4-2WT ("Well Tank") locomotives with working weight of 17 tons running on a 18 inch (457 mm) gauge. 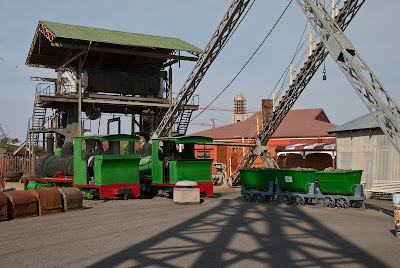 1 September 2009 - She (on the right here) was in operation at De Beers Consolidated Mines Ltd. until mid-1960, and hauled concentrates from the mine to the Central Pulsator Plant. My sincere thanks to Sergio Paliaga who lived in Kimberley for 15 years from '72 to '87 for assistance - he has kindly provided a substantial part of the information below. Also thanks to Bryn Morgan who has also filled some of the missing links. This picture is from a postcard, bought by Sergio at the mine museum. The photo on the postcard was taken by F.M. Beresford at an unknown date. 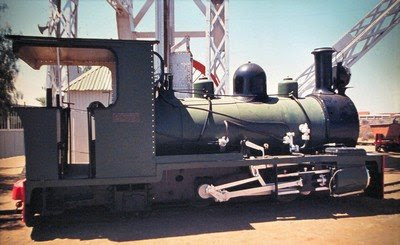 This is a July 1982 picture of "Olive" - a 0-4-2WT ("Well Tank") Bagnall works No.1814 locomotive - an 18 inch (457 mm) gauge engine at the Kimberley diamond mine museum. 26-12-2002 photo kind courtesy of Errol Swanepoel. 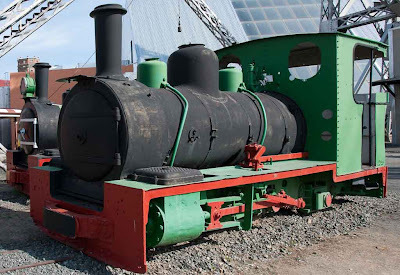 W. G. Bagnall was a locomotive manufacturer from Stafford, England. 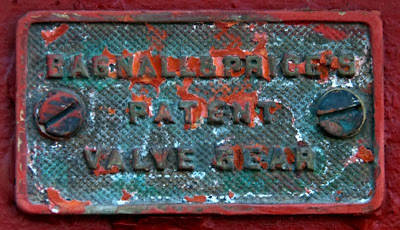 The company was founded in 1875 by William Gordon Bagnall and ceased trading in 1962 when it was taken over by English Electric Co Ltd. 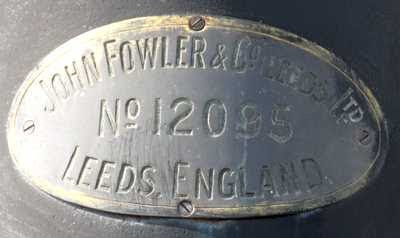 The company was located at the Castle Engine Works, in Castle Town, Stafford. 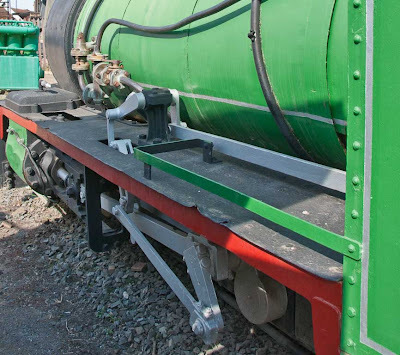 The "Olive" locomotive is of interest as it has the water tank between the frames (thus the "Well Tank" type indication) - this was done to keep the center of gravity as low as possible on the very narrow gauge, and hence the necessity for all the motion parts to be on the outside of the frame - this particular locomotive exhibits the special modifications which was required to make this type of design possible. W.G. 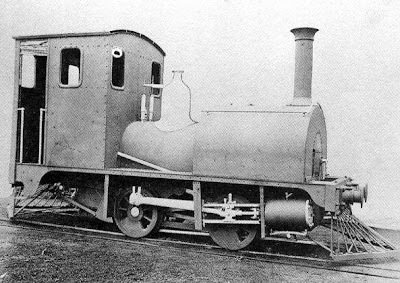 Bagnall Ltd 18 Inch Gauge 0-4-2 Well Tank. 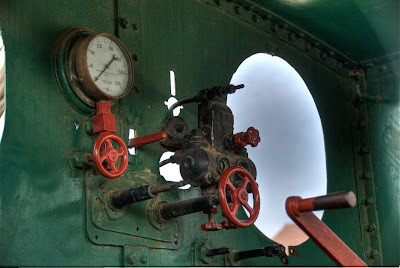 and with "Modified" Bagnall-Price patent valve gear. 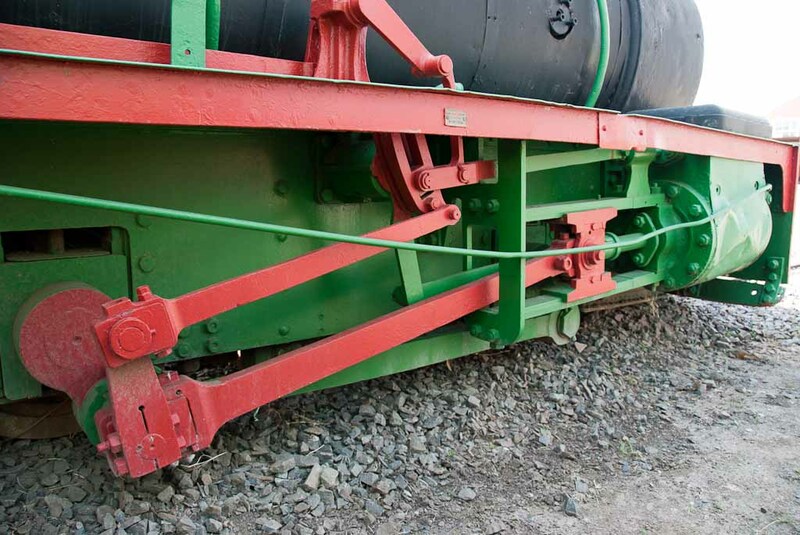 Special Design: Type "Kimberley" : Specially designed for narrow gauge work, and for running round sharp curves. 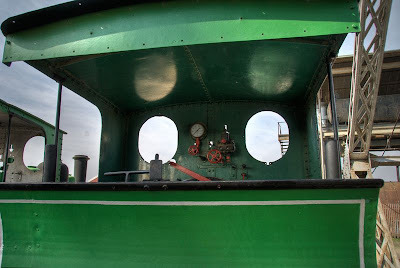 Water tanks arrange between frames and fuel at back of footplate. 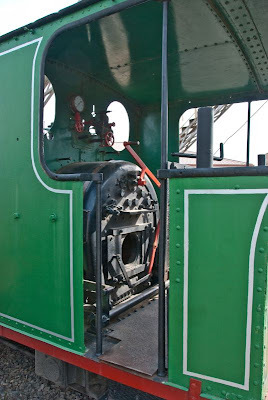 Wheels inside frames and low buffer beams. Fitted with cope fire box and brass tubes. 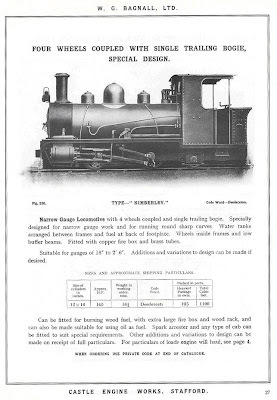 Catalog page describing details of the "Kimberley" type engine. In addition: the frame length of the locomotive is 18 feet and the width of the frame is 6 feet 6 inches, making it a huge engine for the 18 inch gauge! Another slide of "Olive" taken by my father H.D.Conradie on an unknown date in the 1970's. 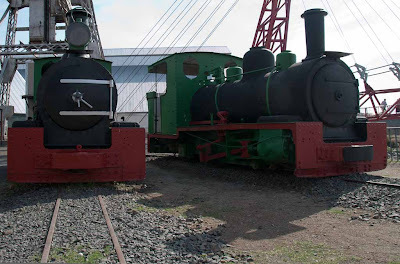 When we visited in September 2005 the diamond mine museum was in the midst of a major reconstruction. Olive was totally inaccessible for visitors. 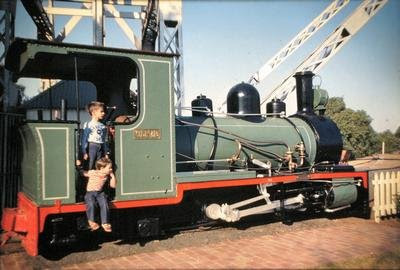 A second Bagnall locomotive was also visible. 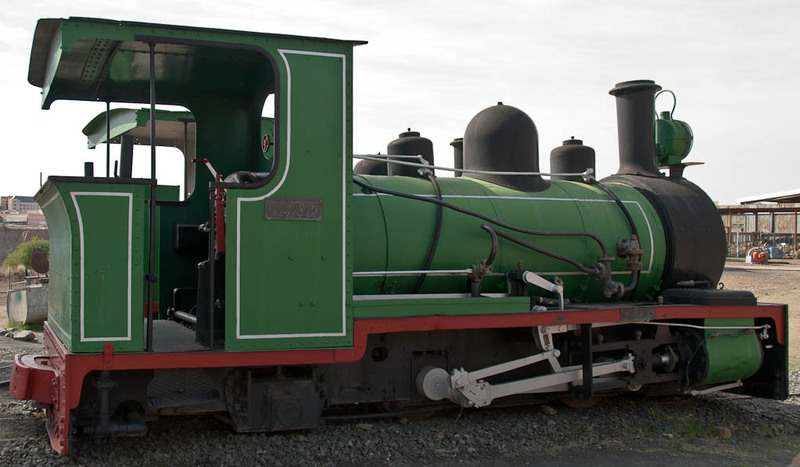 A total of 4 Bagnall loco's were built around 1906 or 1907 for operation at the De Beers Consolidated Mines Ltd. in Kimberley - No.1814 (named Olive), No.1815, No.1816 & No.1817. 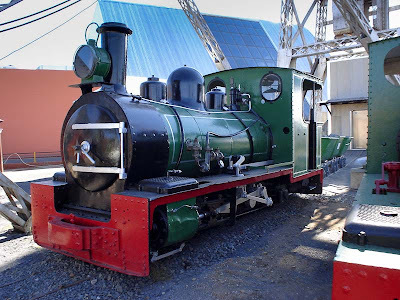 For a number of years No.1817 was preserved in the garden of the Nazareth House Old Age Home before it was also moved to the mine museum to join its elder sister. The fates of No's 1815 & 1816 are unknown. 2005: This gives a slightly better glimpse of the Bagnall works No.1817 locomotive. This June 2007 picture (sourced from the Public Domain) shows Olive in her new position at the redeveloped mine museum - note that the second Bagnall works No.1817 locomotive is also visible in this latter photo. A larger picture of "Olive" can be found here. 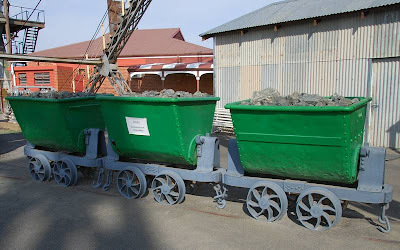 Unknown photographer - this June 2007 shows the glossy cosmetically restored "OLIVE" shortly after the redeveloped mine museum display was reopened to the public. Unknown photographer - Another glossy angle: this June 2007 shows the cosmetically restored "OLIVE" shortly after the redeveloped mine museum display was reopened to the public. 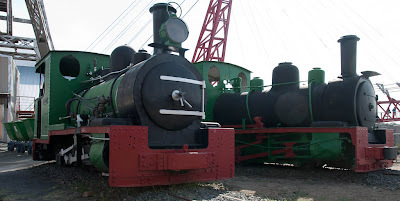 1 October 2009: a general view of the locomotive displays. Olive is in the middle. 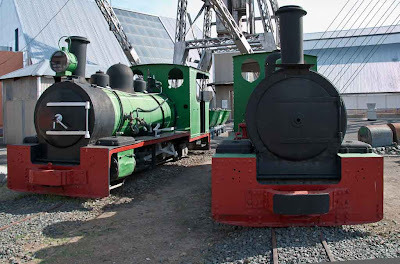 1 September - After two years since opening of the redeveloped mine, the locomotives are again a little faded compared to the glossy painted loco's in June 2007. Bagnall No.1817 is on the left, and No.1814 (OLIVE) is on the right. What everyone wants to know!!! 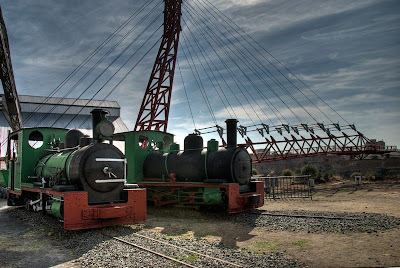 This photo and information is courtesy of Dirk Coetzee, the curator of the Big Hole museum. 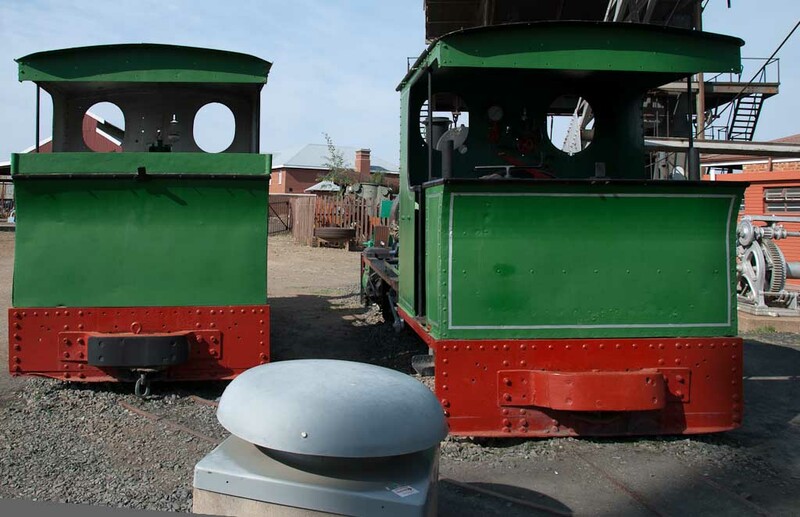 There is much speculation about the frame width of these 18 inch gauge locomotives. Here is one example of such an discussion. They are really oversized for the gauge! 1 September 2009 - even more details! 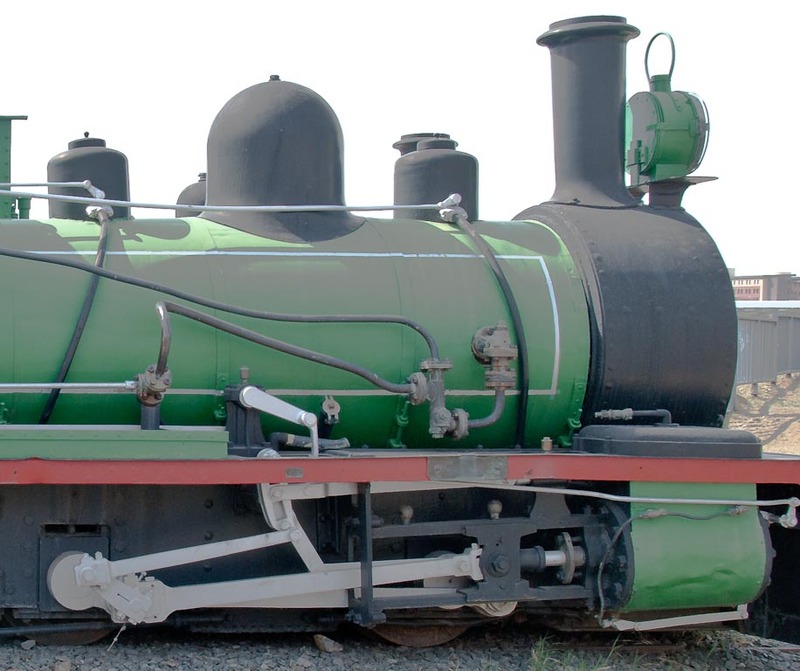 Notice the width of the locomotive with regard to the 18 inch track! Apparently the cab roof was extended for South African conditions. The drawing below shows the extension (provided by Sergio). 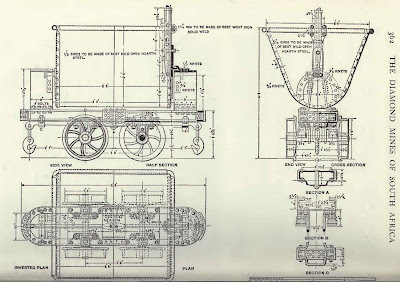 The following article and drawings comes from the April 1911 issue of "The Locomotive", and were kindly provided by Sergio. A higher resolution version is available if you click on this image. 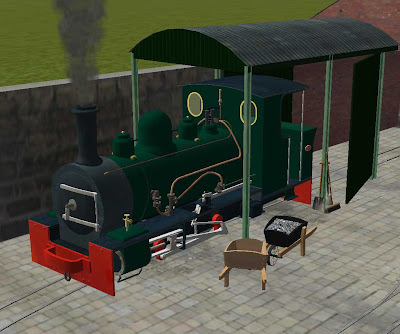 The De Beers Bagnall seen here outside the Old Works loco shed. A virtual creation by Keven for use on TrainSim. Read more in this forum. 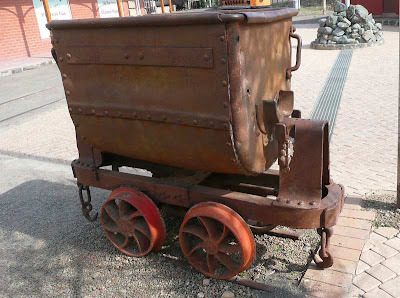 Mining Tipcarts / "Tramcars" /"Cocopans"
One of the mining tipcarts (also "tramcar") which was used to transport concentrates holding diamonds. Locally in South Africa these are known as "cocopans" - a word probably coming by folk etymology from the Afrikaans words "KOEK" (cake) + "PAN"(pan). 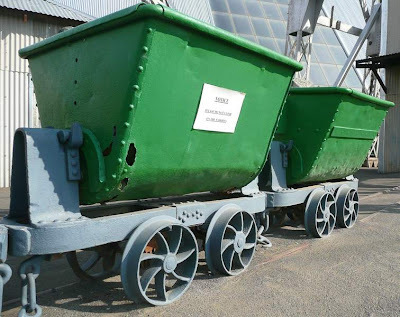 Imagine "Olive" tramming a long line of these tipcarts heavily laden with concentrates coming from the mine on way to the Central Pulsator Plant. 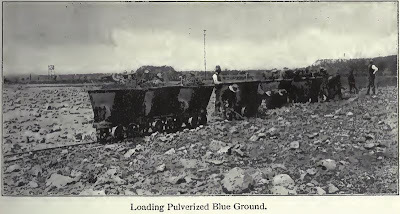 Collecting the blue in the mine - note the use of trucks and mules. The funny looking little 0-4-0 saddle-tank engine in this picture was built in 1881 by Ruston, Proctor and Co (now better remembered for their agricultural machines than steam loco's) as their works no. 7273. 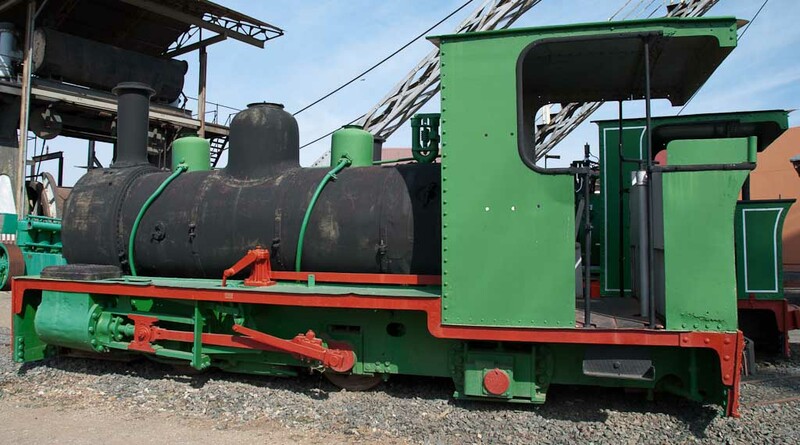 The locomotive in the photo (sourced here) is the one which was supplied to the Kimberley diamond mines. This engine was 9ft long over the buffers. 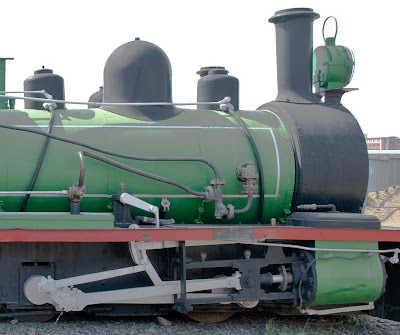 It had a 9.5in x 16in cylinder design using Stephensons valve gear. 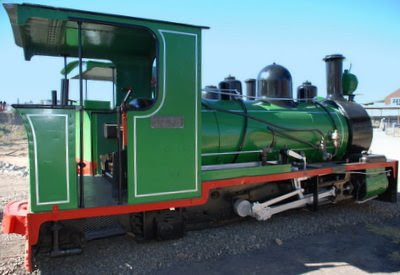 A similar locomotive (works no 7272) was supplied to the Cape Government Railways (CGR), but it did not have spring buffers, and was without hook en chain couplings - the CGR loco had the standard bell-buffer type. 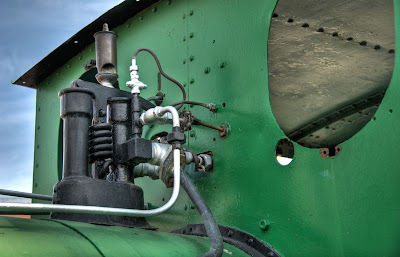 The CGR engine was known as "Coffee Pot". 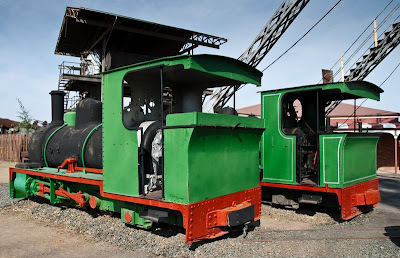 "Coffee Pot" was the 1st steam loco to cross the border between the Cape and the Orange Free State as it was used for the construction of the temporary railway bridge across the Orange River at Norvalspoint before the permanent bridge was completed. Information source: Frank Holland's Steam Locomotives of the SA Railways Vol2. 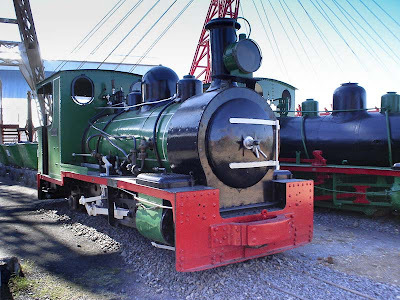 NOTE: This account was written in 1901 - several years BEFORE the 4 Bagnall locomotives were put into service at the mine. 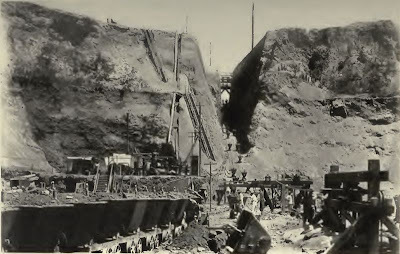 Premier Mine - looking from the Workings up through the Incline where the Blue Ground is hauled. 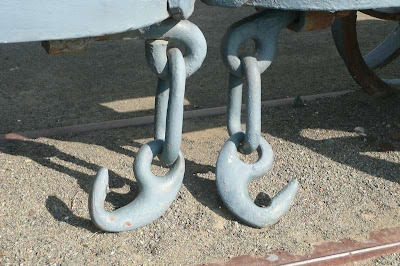 As fast as the blue ground is dumped automatically from the skips into the ore bins, it is carried away in trucks by an endless wire rope haulage, driven by steam, to the depositing floors. These floors are made by removing the bush and grass from fairly level stretches of ground. After clearing the face of the ground, it is hardened and smoothed with heavy rollers until it is fit for use. Receiving grounds are laid out separately for each of the diamond mines on the four farms, and cover an area of several thousand acres. 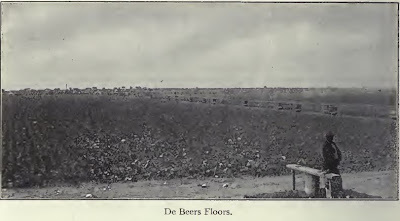 The most extensive of any are the De Beers floors, which are laid off in rectangular sections, six hundred yards long and two hundred yards wide, on the farm, Kenilworth, adjoining the mine. They begin about a mile from the mines and extend for three miles in the easterly direction and a mile to the west. 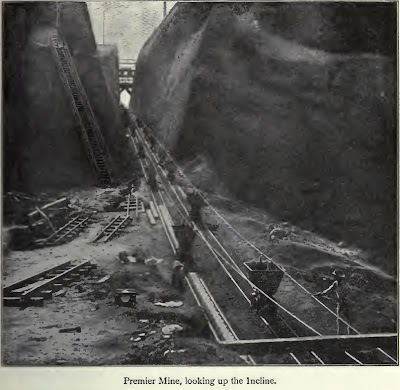 The main tramway line from the mine is three miles in length, with two branches, one mile and three quarters of a mile in length respectively. The speed of the running trucks ranges from 2.5 to 4 miles an hour, and they are counted and greased automatically as they are sent on to the floors. 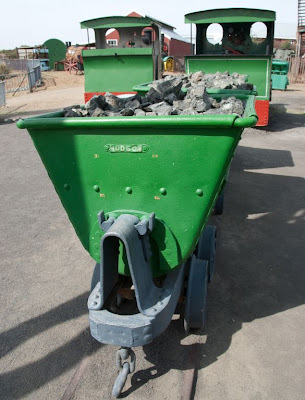 There is a slight down grade from De Beers and Kimberley mines which is of material service in lightening the drag of the loaded trucks. 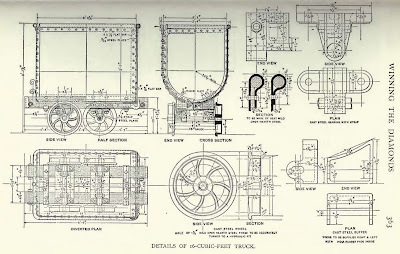 When the trucks reach the floors, they are drawn by horses or mules over auxiliary tram lines at right angles to the main haulage line to any desired point of deposit. A full truck contains about 16 cubic feet of blue ground, weighing 1600 lbs. approximately; but it was found more convenient to supplant these end-tipping trucks by 20 cubic feet side-tipping trucks. The old unit of measurement, 16 cubic feet, has been retained, and the automatic counters are so geared that every time four 20-cubic-feet trucks pass them, five truck-loads are registered. Each of the rectangular sections of the De Beers floors holds about 50,000 loads. 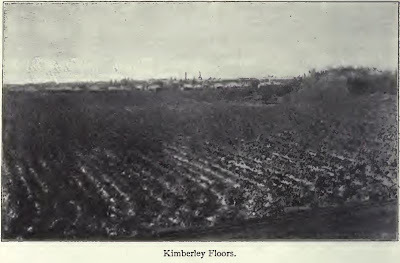 The Kimberley floors are nearly as large, and substantially the same method is employed in covering them. On the depositing ground a truck-load is spread out to cover about 21 square feet. So over the miles of floor surface is outstretched an enormous carpet of "blue" somewhat less than a foot in thickness, and sprinkled with invisible diamonds. It may appear to the reader that the word " invisible " is used to convey the idea that the diamonds are very small, but such is not the case, for many of the diamonds lying buried are as big as filberts, and it is not unusual to find them as large as walnuts. What is meant is that the diamonds contained in the blue ground are invisible to one walking casually over the floors even after the ground has pulverized. During the fifteen years of my charge of De Beers mines I have never found a diamond on the floors. It will be seen that no pains have been spared to hasten and cheapen the flow of ground to the floors. After the blue ground has been spread out, it is necessary to wait patiently until the sun and the rain have contributed their service in disintegrating the breccia. The effect of the exposure of this curious compound to heat and moisture is very remarkable. Large pieces of blue, which are as hard as sandstone when freshly taken from the mine, soon begin to crumble on the depositing floors. To hasten the disintegration, the bed of blue is harrowed several times to turn up the bigger lumps and expose fresh faces of the ground to the sun. 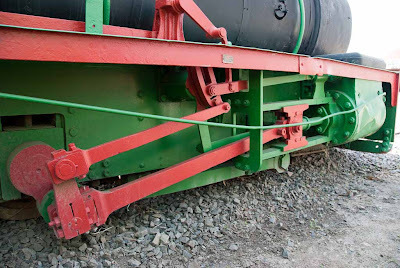 Spans of mules were originally used to drag the light harrows used in those days, but steam traction engines are now employed to draw wheeled harrows with huge teeth to and fro across the floors. So the great spread of the floors looks like some vast ploughed farm where the laborers are preparing the soil for seed. The length of time required to effect the desired degree of pulverization depends on the season of the year and the amount of rainfall. It is curious to note, also, that there is a marked difference in the rapidity of disintegration of the blue ground in each of the four mines. 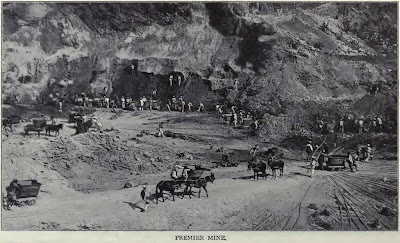 The blue from Kimberley mine becomes well pulverized in three months with heavy rains in the summer season, while the De Beers blue requires double that time. 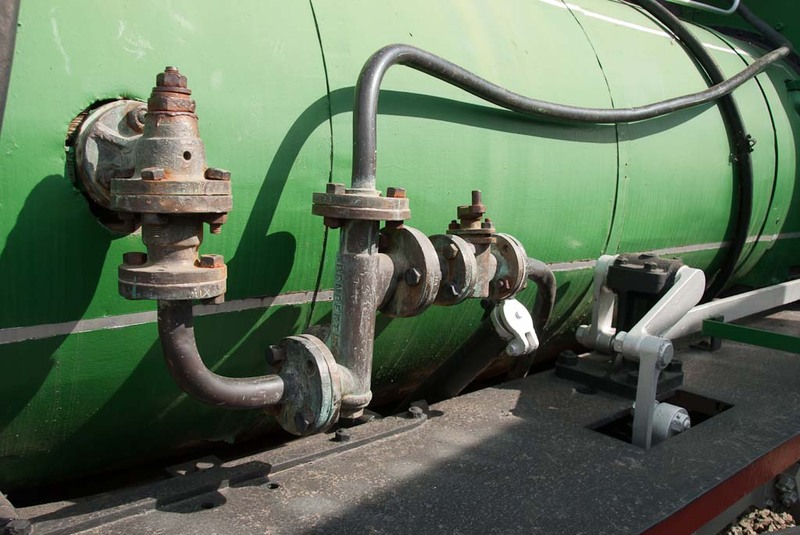 The longer the exposure, the more complete the pulverization, and the better for washing. The long continuance of droughts, which are of frequent occurrence, causes very costly delay. 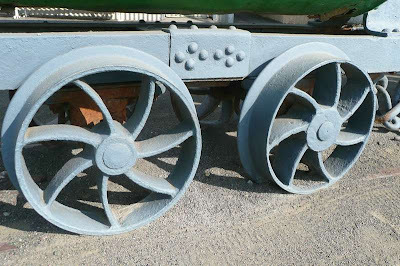 Under normal conditions soft blue ground becomes sufficiently pulverized in from four to six months, but it is better to expose it for a longer period, even for a whole year. The well-disintegrated blue ground is taken from the floors in trucks by endless rope haulages to the washing machines and put through the first stage of concentration. 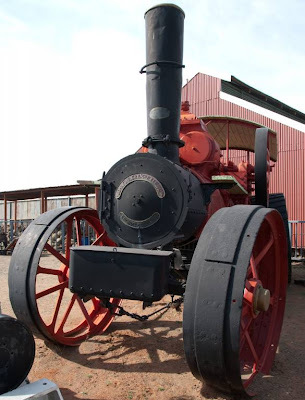 This Steam Ploughing Engine forms part of the display at the mine museum, and was one of the machines used to harrow the "blue" on the "Floors". 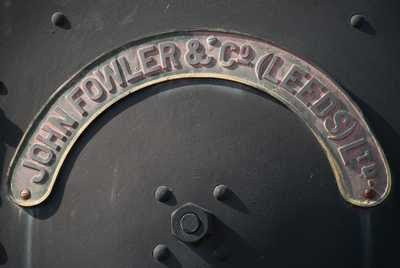 John Fowler works no 12100 was built in 1909. 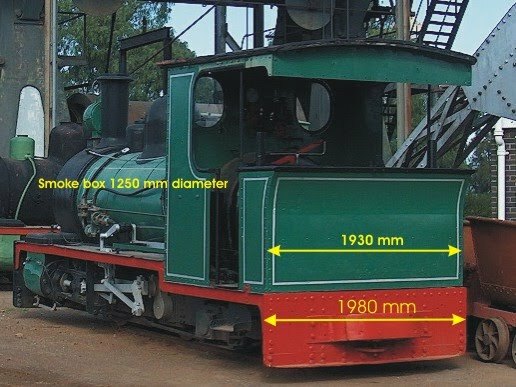 No 12095 therefore is likely to also have been built in 1909. 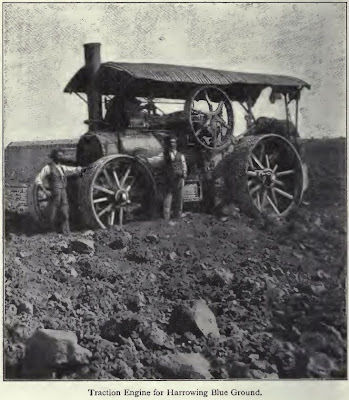 John Fowler's ploughing (or harrowing) system used a steam engine on one side of the field and an "anchor" on the other side. Between them they pulled the plough or harrow across the field by a cable. 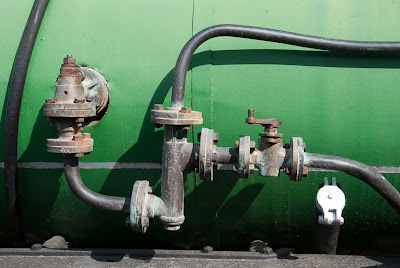 This arrangement of keeping the engine at the side of the field solved the problem of the heavy steam engine compacting the soil. Brilliant! Thank you so much for posting so many photos of Olive.